TechNiche garments are made with a unique Polymer Embedded Fabric (PEF). When submerged in water for 60 seconds, the PEF absorbs water and stores it inside powerful polymer crystals. The encapsulated water then evaporates slowly (8-12 hours) creating an extended cooling effect. 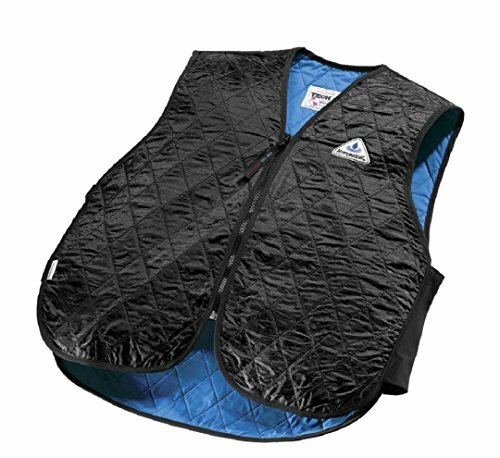 EVAPORATIVE COOLING VESTS allow Outdoor enthusiasts to stay cool for hours. The inner liner is 100% Nylon Taslan which is a water repellant fabric and thus provides the user with a cool, but dry garment. They are lightweight and reusable over and over. These vests are designed to be worn outside of other clothing to ensure proper evaporation of the absorbed water. Please note, the evaporative cooling vest can lose its effectiveness and ability to hold moisture if it is used only occasionally. Stay cool in warm weather! Great for runners, hikers, or just for hanging out. Soak in water 1-3 minutes, wring out excess water. Re-hydrate as needed, hang to dry when not in use. If you have any questions about this product by Techniche, contact us by completing and submitting the form below. If you are looking for a specif part number, please include it with your message.